We are a certified household of book lovers. I spent a large portion of my childhood with my nose in a book, and have been fortunate enough to have been able to work as a library assistant at times during my very varied work history. Matt (hubby) loves historic novels and is working his way through classic literature at the moment. We both read to the boys during the day, and especially at bedtime, so I guess it's no surprise that the boys love books too. Ollie went to sleep grumbling tonight because I only read him four books and he wanted me to read him 'ten books' - he picked what he wanted from his bookshelves and then staggered in to my room under a pile of actually about twenty books. 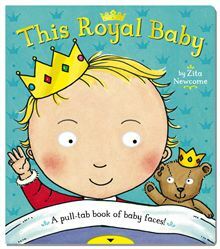 We all love Macmillan's books, and so were hugely excited to receive some books from them to review this week. There were two for Toby, and two for Ollie. 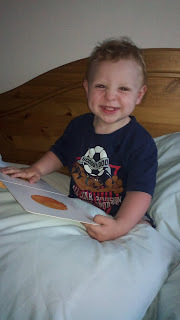 Look out for another post later on reviewing Ollie's books. 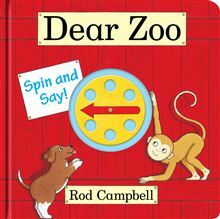 The first book out of the parcel was Dear Zoo Spin and Say and was met with a lot of enthusiasm from both boys. It is an activity version of their much loved (and well worn) Dear Zoo book. Instead of the narrative and lift-the-flaps of the version we already have, this one comes with spinners and a variety of new characters. Toby loved spinning the pointer around and having myself or Ollie calling out what it had landed on. He also liked roaring at any animal the spinner landed on that he thought might roar. This board book was extremely well built and should survive as much attention as it's predecessor has. It is also a lovely way to teach animal recognition skills, colours, numbers and counting, either as a first introduction in smaller children, or to increase and cement previous learning in slightly older pre-schoolers. It is a fantastic addition to our home-story telling toolbox too. Spin the pointer and pick an animal to begin your tale, then keep spinning to select other elements as you go along. 'I went to the zoo and I saw a ....spin....leopard, I tried to have lunch with it but it was...spin...too scary, I went next door and found a ....spin....blue...spin....kangaroo etc... This kind of game mixes random elements with your gentle guidance in a direction you think the story will take, plus lots of not-so-gentle ideas from your little one. Most of ours somehow end up involving poo.